Summerhouses are typically wooden outdoor garden structures that feature felt or tiled roofs, and a number of windows and glazed doors to allow daylight to shine in. Despite what the name might suggest, our summerhouses can be used comfortably throughout every season. Having a summerhouse in the garden has endless potential for personality and character, and will almost certainly create a focal point to complement your garden’s theme. It will also give you additional living and relaxation space, as well as storage space. Why not get inspired now with our Summerhouse Gallery, which is full of design and style ideas? What Are Summerhouses Used For? Over the years, we have noticed that most people use our Summerhouses as a “lifestyle” product - used for entertaining and relaxing or as Garden Offices, hobby or craft rooms. In comparison, our range of Garden Sheds are used more often for “practical” uses such as DIY workshops or for storing gardening equipment and tools. Does A Summerhouse Need Planning Permission? As a general rule, (in the UK) summerhouses are considered “permitted development” and don’t usually require planning permission (there are exceptions to this rule). 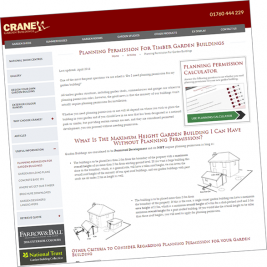 Our article, Planning Permission for Garden Buildings gives more detailed information. Alternatively, you can access our planning permission calculator, which will tell you if your property will require planning permission or not. What Size Summerhouse Should I Buy? Summerhouses are available in all shapes and sizes; what you want to use it for, the space available (see also Planning Permission above) and your budget will dictate what size you should buy. A larger summerhouse may be suitable for use as a dining or socialising space, or as a craft, hobby or work room – our range generally comes in sizes up to 5.4m x 6.0m (18ft x 20ft) however, our Morston Summerhouse, which includes a veranda, is available up to 6.0m x 6.6m (20ft x 22ft). You may want a more intimate space for small gatherings or personal hobbies. Our Wiveton Summerhouses offer more compact sizes, which start at 1.8m x 1.8m (6ft x 6ft). Alternatively our Weybourne range, which are designed to fit into a corner, may suit a smaller size garden. As with most things in life, you generally get what you pay for with Garden Buildings. A mass-produced summerhouse, costing a few hundred pounds, is unlikely to last more than a few years. We pride ourselves on producing market-leading products, using only the highest quality timber and workmanship, which provide long-lasting protection and durability. Every garden building is hand-built at our factory in Norfolk, by our expert carpenters and joiners to maximise quality and longevity. Can I Design My Own Summerhouse? Our Online Summerhouse Design Tool allows you to customise your own garden building by choosing the doors, windows, interior and exterior to your exact specification. This tool will generate an immediate quote, which you can save and amend as often as you like. How Can I Find Out More About Summerhouses? To see our summerhouses, as well as all of our other garden buildings, you can visit one of our seven UK Show Centres. If you have any questions, you can Request a Callback, Contact Us, or call a member of the team directly on 01760 444 229.